We were on the Coast to Coast walk across northern England and had overnighted at Grasmere in the Lake District. The fifth day: Our fellow breakfasters were an American couple who had walked the Coast to Coast path three years ago. Every year they return to Grasmere for a couple of weeks to indulge their passion for daily rambles in the district. Bob, our host, brought us food and regaled us with stories of his maritime days travelling the world as a “chippie” and later as a fiddler with a musical group. I asked Bob whether B&B owners ever ate their own fare. Since the unexpectedly good weather had caught us unprepared, it was necessary to buy some sunscreen lotion as both of us we re beginning to look as red as English postal boxes. We consulted our map for today’s route. 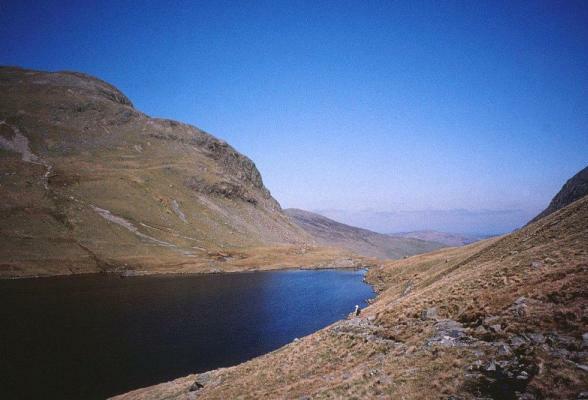 First we were to climb to Grisedale Tarn and from there we had three options. The brave at heart could climb one of Lakeland’s best known peaks, Helvellyn. The second option was to stride out along the neighbouring mountain route of St Sunday Crag,and the last option and least arduous – which we chose – was to follow the Grisedale Valley into Patterdale. Occasionally Carol and I liked to walk separately, to experience some time alone. In this mode I began the ascent to Grisdale Tarn. The sun was warm and a slight wind kept the air fresh. My boots felt comfortable and my fitness much improved from the first day at St Bees. “ It may have been a piece of Wainwright!” he chortled. I laughed, finally getting the joke. (Wainwright had requested that his ashes be scattered over his beloved ‘Haystacks’ – a rocky section of the range). A little further on was the dark water of Grisedale Tarn. Here I caught up with Carol and we ate our sandwiches in the embracing sunshine. On our left was the huge climb to Helvellyn and glory, while the remote peak of St Sunday Crag was visible on the right. Tiny figures resembling stick insects were slowly making their way along the distant ridges. For a moment an errant thought crossed my mind, maybe we should try the Helvellyn ascent. However, the relaxing sun and gentle breeze soon blew that thought away. Near the track was a large rock known as the “Brothers Parting Stone”. It was on this spot that William and Do rothy had farewelled their beloved brother, John. John was off to Penrith, en route to take command of a ship in the English fleet. He was never to return to Dove Cottage, as he drowned a few years later when his ship was wrecked. Inset was a weathered, almost unreadable plaque, but the spirit of departure remained. Up here were the flowers that John Wordsworth had loved, like the daisies which grew near the tarn. Daisies were originally known as “Day’s Eyes”, an emblem of Freya, the northern goddess of rain and sunshine, and they represented innocence. Since we had climbed up to the pass the next few kilometers should take us on a decline…… more later.